It was one of those soggy wet days when it always seems to down pour just when you need to make things happen for your client. Steve and Purvi were looking to hire a Toronto wedding photographer who could be both creative when need be to produce stunning images and skillful to see and capture the candids that define a moment. My name came up as a referral which is always great, so I needed to live up to the reputation that Exposé Studios has enjoyed for so long. This is not an easy task on a day like this, but I was confident in my client and our rapport. The image I posted is one of my favourites from that day, it just seems to have it all. The cloudy skies cast down a gentle, even light all around which really helped to capture the entire tonal range from the whitest whites right down to pure black. My Nikon equipment performed great even in these conditions, really contributing to the speed in which I was able to create this fantastic image. Steve and Purvi were great to work with and 100% on board with whatever we suggested, but it was just pouring rain out there so I knew I had to be quick. I like to shoot in manual mode on my Nikon for complete control, but I did rely on the SB900’s TTL to help produce that beautiful backlight you see in this photograph. Those Nikon flashes did their job and produced just the right amount of light and coverage to highlight their faces, enhance the rain drops, and give the umbrella a nice glow of separation. 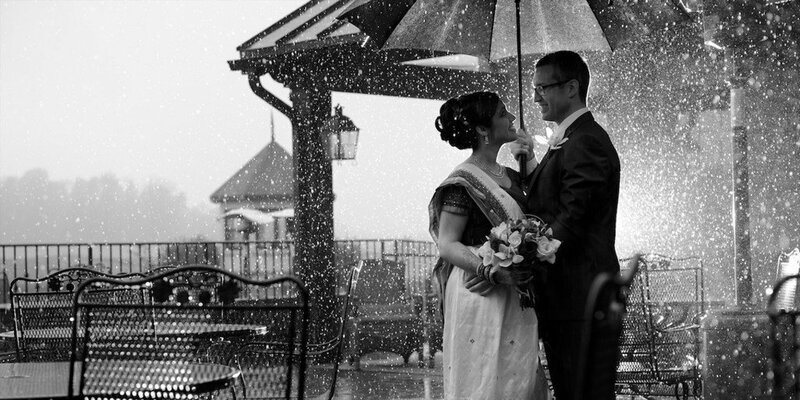 To really bring this photograph to life, Steve and Purvi really enjoyed the moment. The bride has a subtle tilt in her head that conveys a natural and comfortable feeling as she looks to her husband for his thoughts. The groom responds with his own genuine smile and even though the shot was directed, the photograph still captures a stunning moment of this couple’s day in what appears to be an intimate exchange between husband and wife. I really love this image, it’s one of my true favorites!